A Chadron native, who recalls he “hated running” when he was in high school in the mid-1970s, has written a book some 40 years later telling how much he loves it, or at least how it has become his passion and made him much healthier. The runner-turned-author is Bill Watts, who lives in Littleton, Colo. His book is titled “Running for the Average Joe.” It is being recognized as ranking among the most comprehensive books ever written about running, covering what one noted runner says is “everything from A to Z” about what has become one of America’s more popular and healthier activities. Watts, 59, said he got what amounted to a “wakeup call” on January 1, 2002 when he learned that his blood pressure, cholesterol and heart rate “were all through the roof” and he tipped the scales at 199.5 pounds, a lot more than he should have weighed. He knew it was time to change his lifestyle or he was in trouble. Although he refuses to call it a New Year’s resolution, his new resolve has remained with him. While he said initially he couldn’t jog more than halfway around a 400-meter track without thinking he would pass out, five months later on Memorial Day he was in the throng that ran the Bolder Boulder. Since then he’s run hundreds of 5-K and 10-K races and completed 88 marathons, which are 26 miles, 385 yards, in 31 states and also has run numerous longer races, often to benefit causes he supports. Watts’ vital health statistics are now in the normal range and he weighs 158 pounds. He has covered some 58,000 miles while training and participating in races since he adopted his new lifestyle. 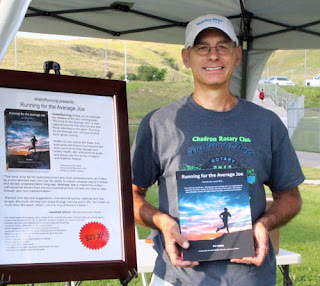 His book also covers nearly every topic imaginable related to running. They range from advice on what to look for while buying socks, shoes and other equipment, how to get started, or in his words, “get off the couch and down the street,” what to eat, what not to eat, how to change your foot placement and stride so running will be more comfortable and even what to do in case you’re injured. The 296-page book that is printed in 8 ½ x 11 format, is attractive. It’s filled with graphs, charts, tables, photos, scientific information and tidbits of runners’ experiences, including Watts’. It also includes a history of running dating back to five centuries before Christ when Pheidippides, according to legend, ran 150 miles in two days to seek military assistance from the citizens of Sparta when it was learned that the Persians were invading Greece. The next day, after battle was over, Pheidippides ran the 25 miles from the battlefield to Athens to tell everyone “We won,” then collapsed and died. Watts doesn’t short-change his readers. Thirty pages are devoted to nutrition and hydration. He lays out endless options on training possibilities. Even readers who are not interested in running will enjoy the dozens of motivational quotes that are sprinkled throughout the book. They are statements made from famous athletic figures such as Babe Ruth, George Halas, Michael Jordan and Dan Gable as well as American notables such as Abraham Lincoln, Henry Ford, Henry David Thoreau and John F. Kennedy. The book is dedicated to, among others, his parents. Watts’ father was legendary Chadron High School coach Gordon “Fuzz” Watts, whose football teams rang up a 79-16-4 record from 1954 through 1964 and were undefeated three of those 11 seasons. His mother, Bonnie, now 87, lives in Casper. Bill, who is a senior systems engineer for Arapahoe County in the Denver area, is the youngest of the four Watts children. The oldest, Patti Chasek, lives with her husband, Bernard, on a ranch south of Chadron and is the music director at St. Patrick’s Church, among other activities. Another sister, Debbi, is a homemaker in California, and a brother, Mike, is a railroader in Wisconsin. Although the visit was not planned, Watts was in Chadron for Fur Trade Days in July. A few days prior to that, he had started running the Colorado Trail, a 516-mile venture in the mountains. But after covering 63 miles in 15 hours the first day, he ate what he describes as “bad food,” became ill and had to drop out. After a day or two of recovery, he visited his hometown, sold several copies of his book and also gave them to the winners. Shortly after the book came off the press in March, he donated copies to both the Chadron High and Chadron Middle School libraries. The Chadron Public Library also has purchased the book, which last month was No. 8 on the Denver Post’s list of non-fiction book sales. This year was not his first Fur Trade Days experience. In 2015, he set the 50-and-over age group record in the 10k race. Last month he went back to the Colorado Trail challenge and completed the entire route in 13 days, averaging about 40 miles a day while making a total elevation climb of more than 92,000 feet, the equivalent of climbing Mount Everest three times. The book may be purchased through outlets such as Amazon and Barnes and Noble or by emailing wattsrunning.com. The price is $24.95 plus postage.